Atlanta, like many other major cities in this country, faces lots of pollution issues. One big issue is waste that people have outside their homes in urban areas. The Clean It Up Atlanta campaign, put on by the department of public works, has tried to identify these most affected areas and urge residents to begin cleaning up debris and waste around their properties. The campaign sends out people from the Solid Waste Education & Code Enforcement Team. The team informs the residents of how their property may be subject to fines due to property code and dumping law violations. 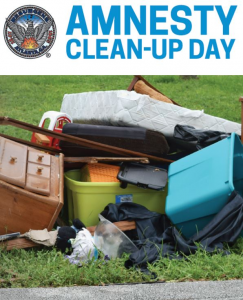 The campaign then holds Amnesty cleanup days around Atlanta. Prior to these days officials educate and inform the people more about how to clean up their waste and get their properties back up to code. They then encourage residents to cleanup and remove debris on those days so Solid Waste Services can come pick up the waste. Any residents still in violation after these days are then subject to fines. The Clean It Up campaign is in conjunction with the Keep Atlanta Beautiful Commission. the commission focuses on inspiring and educating city residents to take pride in their community. They also aid local cleanup efforts by providing supplies, resources, and support. The Keep Atlanta Beautiful Commission has many different initiatives on how they keep their mission in action. They organize neighborhood cleanups and adopt a spot program. This makes areas concentrated with litter the focus of the cleanup effort. They also have trash can programs where the commission installs and maintains bins around the city. These initiatives show a lot of promise for Atlanta’s cleanup. What Atlanta has that many other places do not is strong support from the government. All of these initiatives are in association with government agencies and supported with government.